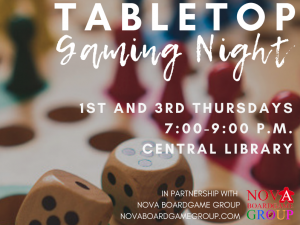 As always, everyone is welcome to join us at Arlington Central Library tonight (Thursday, Nov. 15th) from 7pm to 9pm for a night of fun, new friends and fantastic board games. We will have a few teachers on hand to guide you through some games. Or, you can grab a game from our collection, find a table, and learn it with some new friends! See you all tonight! Caribou skins optional!